Probably used as much for display as for actual seating, these richly carved and gilded armchairs would have been arranged against the walls of a reception room in a Venetian palace in the 1700s. 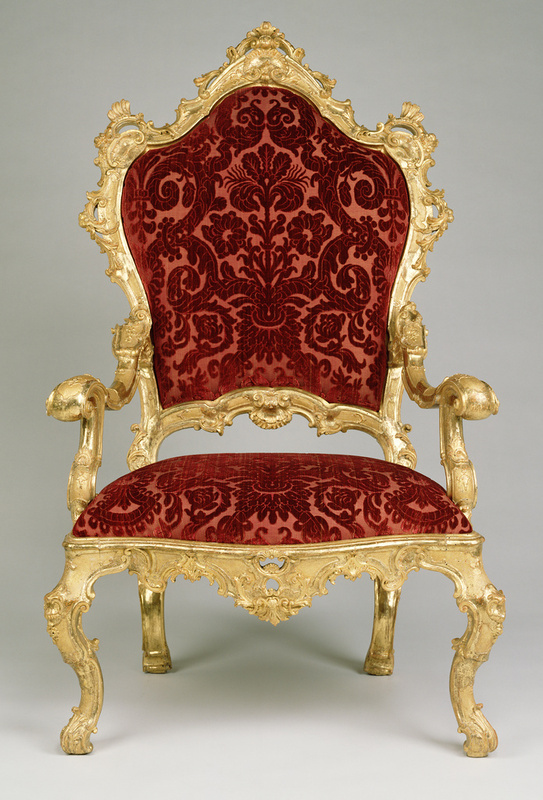 With their combination of exuberant and delicate forms, these chairs are characteristic of the mid-eighteenth-century transition from a heavier, Baroque furniture style toward the more graceful and voluptuous forms of the Rococo. Although their maker is unknown, the armchairs show strong stylistic similarities to furniture attributed to the sculptor Antonio Corradini. He is best known for his carvings on the last Venetian state barge; by studying fragments of this ceremonial ship, scholars have been able to attribute to this artist a number of side chairs, consoles, tables, and a throne. The Getty Museum's chairs, with their scrolls, garlands, and leafy motifs, share their lavish carving and elegant proportions with other works by Corradini. "Acquisitions/1987." The J. Paul Getty Museum Journal 16 (1988), pp. 180-81, no. 78, ill.
Bremer-David, Charissa, et al. Decorative Arts: An Illustrated Summary Catalogue of the Collections of the J. Paul Getty Museum (Malibu: J. Paul Getty Museum, 1993), p. 192, no. 326, ill. The J. Paul Getty Museum Handbook of the Collections. 4th ed. (Los Angeles: J. Paul Getty Museum, 1997), p. 264-65, ill. (only 87.DA.2.1). Masterpieces of the J. Paul Getty Museum: Decorative Arts (Los Angeles: J. Paul Getty Museum, 1997), p. 76, no. 57, ill. (only 87.DA.2.1). Wilson, Gillian, and Catherine Hess. Summary Catalogue of European Decorative Arts in the J. Paul Getty Museum (Los Angeles: J. Paul Getty Museum, 2001), p. 212, no. 424, ill.
Libby, Alexandra, and Stanton Thomas, eds. Venice in the Age of Canaletto, exh. cat. (Sarasota: The John and Mable Ringling Museum of Art, with Prestel Publishing, 2009), pp. 132-33, cat. 33, ill. (only 87.DA.2.3). Schenkenberg, Tamara H. Exquisite Everyday: 18th-Century Decorative Arts Objects from the J. Paul Getty Museum (St. Louis: Pulitzer Arts Foundation, 2016), pp. 4-5, ill. (only 87.DA.2.3).